Intermedia’s 2015 Small & Medium Businesses Mobile Trends Report is here! If you’ve read the news lately, you’ve probably seen a story or two about Android overtaking Apple’s iOS in the consumer market. It’s not hard to see from a consumer perspective why Android is so desirable. Android phones are available from a number of manufacturers, with a broad spectrum of sizes, features and price points. But this got me thinking. Does this conventional wisdom hold true for business users? 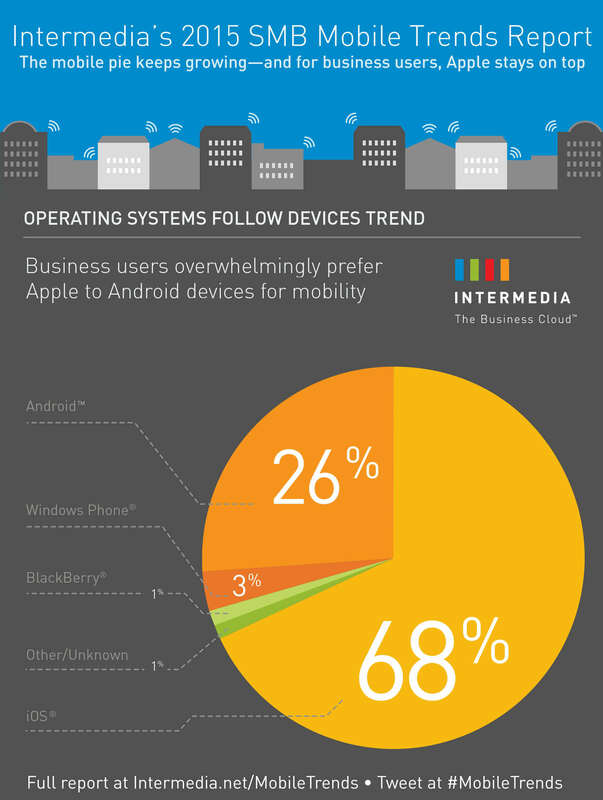 Contrary to popular belief, findings from Intermedia’s 2015 Small + Medium Business Mobile Trends Report found that business users overwhelmingly prefer Apple’s iOS over Google’s Android for mobility. iPhones and iPads accounted for over two-thirds (68 percent) of the 446,752 mobile devices newly activated on Intermedia’s network in 2014. Android was a distant second accounting for 26% of activations by business users. SMBs prefer the iPhone 6/6 plus over the iPhone 5s/5c. The iPhone 6/6 plus accounted for 32% of all Intermedia device activations from its September 2014 launch date through the holidays – nearly 50% bigger than the iPhone 5s/5c launch. Samsung saw some gains…but only slightly. Samsung increased its share of activations on Intermedia networks 16.7% in 2014, up from 14.9% in 2013. Is demand for tablets shrinking among business users? Findings show iPad’s 2014 share of SMB mobile device activations dropped 5 percentage points from 2012. Want to learn more? Read the full report now.